Soren Kjeldsen (ranked 61st by Golf Predictor) won the Dubai Duty Free Irish Open Hosted by the Rory Foundation on the European PGA Tour. The 40 year old Dane won his first tour title in six years in a play-off at Royal County Down. The magnificent links layout proved to be a stern test for the field in the cold, wet and windy conditions. Kjeldsen bogeyed the penultimate hole and failed to birdie the par five final hole to fall into a play-off with Bernd Wiesberger and Eddie Pepperell. However, the Dane was not to be denied and after two great shots into the eighteenth, just about holed his short second putt for a winning birdie. Our top ranked player, tournament host Rory McIlroy, disappointed the enthusiastic home fans by missing the cut for the second year in a row. He wasn't the only one to under perform in the very tough conditions as overall, we only had only seven of the top twenty one plus ties (7/28). Stephen Bowditch (ranked 68th by Golf Predictor) won the AT&T Byron Nelson on the US PGA Tour. The 31 year old Australian comfortably won his second tour title by four shots with an assured final day performance. Bowditch returned to the scene of his wedding to record more happy memories as he built on a great start in the rain plagued event. So much water fell in the area that the par fourth fourteenth was reduced to a par three after the first round. Our top ranked player, Justin Spieth, finished in tied 30th and overall, we had eight of the top sixteen plus ties (8/21) in total. Byeong-Hun An (ranked 28th by Golf Predictor) won the BMW PGA Championship on the European PGA Tour. The 23 year old Korean won his maiden tour title in record breaking fashion at Wentworth. Tied for the lead overnight with Francesco Molinari, An left the Italian and the rest of the field in his wake to close with 65 (-7) and win by six shots. An finished on a record low score of -21 in his impressive maiden performance at the flagship event. Our top ranked player, Rory McIlroy, put in a tired performance and missed the cut. Overall, we had nine of the top eighteen plus ties (9/21). Chris Kirk (ranked 5th by Golf Predictor) won the Crowne Plaza Invitational at Colonial on the US PGA Tour. The 30 year old American emerged out of a packed leaderboard to win his fourth tour title. After a number of golfers had posted -11, Kirk needed a brave up and down at the last to win by a single shot. Our top ranked player, Jordan Spieth, was one of those who finished second and we had eleven of the top nineteen plus ties (11/23). The predictions and statistics for this week, the BMW PGA Championship (European PGA Tour) and the Crowne Plaza Invitational at Colonial (US PGA Tour), are now available on Golf Predictor. It's the flagship event on the European Tour this week and as usual there is a strong field vying for the title in England, with most of the European stars teeing it up. There's also a pretty strong field in Texas, where local young gun and world number two Jordan Spieth headlines the event. However, he'll have to hold off some stiff opposition, including fellow Texans Patrick Reed and Jimmy Walker. James Morrison (ranked 57th by Golf Predictor) won the Open de Espana on the European PGA Tour. The 30 year old Englishman finally won his second tour title five years after his first with a closing 70. Morrison was never in any real danger on the last day with his nearest challenger David Howell falling away around the turn and no one else applying serious pressure. That allowed the Englishman to par in on the back nine until he finished in style, with a birdie at the last for a four shot victory. Our top ranked player, Sergio Garcia, rallied after a poor start to finish in tied 22nd and we had eight of the top fifteen plus ties (8/21). Rory McIlroy (ranked 1st by Golf Predictor) won the Wells Fargo Championship on the US PGA Tour. The 26 year old world number one was dominant over the weekend, blowing away the field and winning on a record score of -21. McIlroy bettered his own course record by one shot on Saturday with a sparkling 61 (-11) to lead by four overnight. That allowed him to cruise to victory on the final day, winning by seven shots in the end. Including the winner, we had ten of the top twenty plus ties (10/27) in total. New overview page showing player ranks (red) and average position in overall/early/mid/late season. 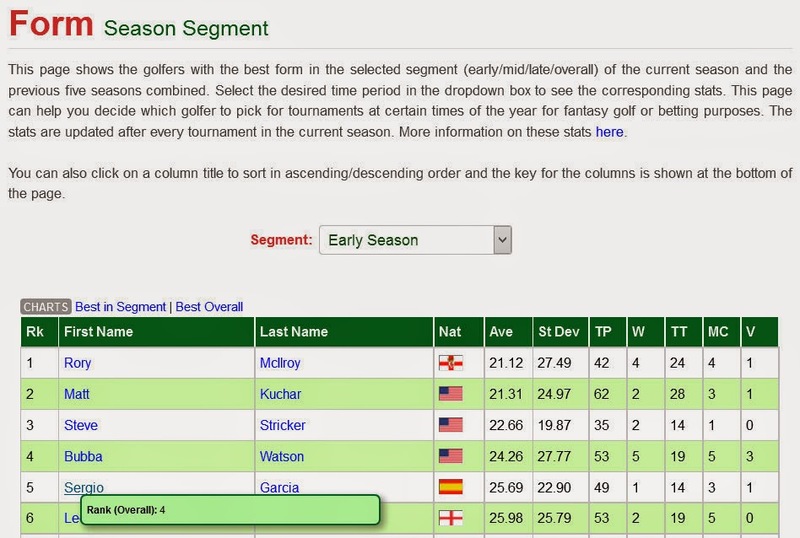 New season segment page showing more stats on selected overall/early/mid/late season form. First snippet of new player page showing overall and early season stats for Rory McIlroy. 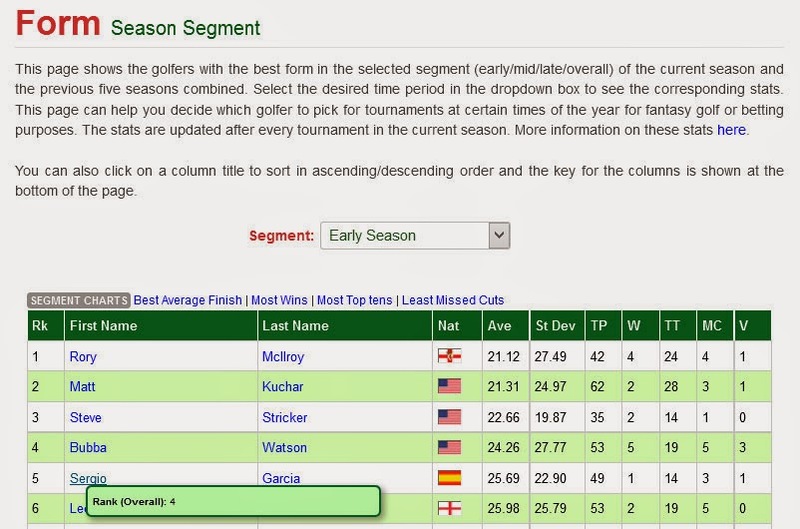 Second snippet of new player page showing the early season results (first page) analysed for Rory McIlroy. I am pleased to announce the addition of very useful time performance analysis to Golf Predictor. This new "Season Segment" functionality is available via two new options from the Form menu which allow you to see who performs better at certain parts of the calendar year. This analysis is based on the results for each golfer in the previous five/six seasons (see point 1 below). This should be very helpful for your fantasy golf, DFS golf or betting needs as it shows who tends to play well versus his peers at certain times of the year. It is well known that some golfers perform better or worse at certain times of the year and this new functionality allows you to spot this easily. The analysis breaks the year into three segments: early (January to April), mid (May to August) and late (September to December) and produces a plethora of stats in each case. 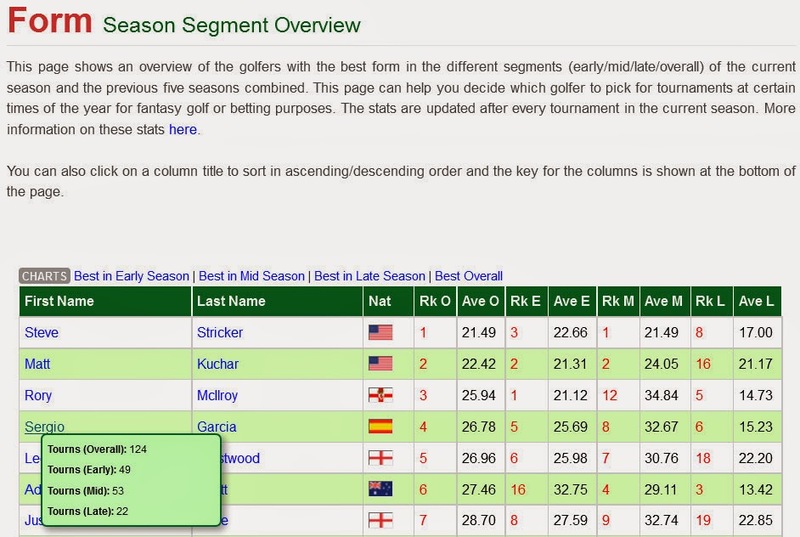 The ranking for each segment is based on the average finishing position for each golfer in that segment of the season. Stats are also produced for the overall period (i.e. all tournaments in the entire period, regardless of time of the year) for comparison purposes. The first screenshot above shows the new overview page, which displays the ranking for each golfer in each of the season segments. These ranks are displayed in red for legibility and by sorting these columns, you can see at a glance who is (much) better at one time of the year than another. Hovering over the golfer's first name will show the number of tournaments played in each segment, as shown above for Sergio Garcia. The second screenshot shows the other new page available from the Form menu, where you can see the early/mid/late/overall season form in more detail for the field. Simply select the season segment of interest from the dropdown list to see the relevant stats. As usual, hovering over the golfer's first name shows more information, as shown above. 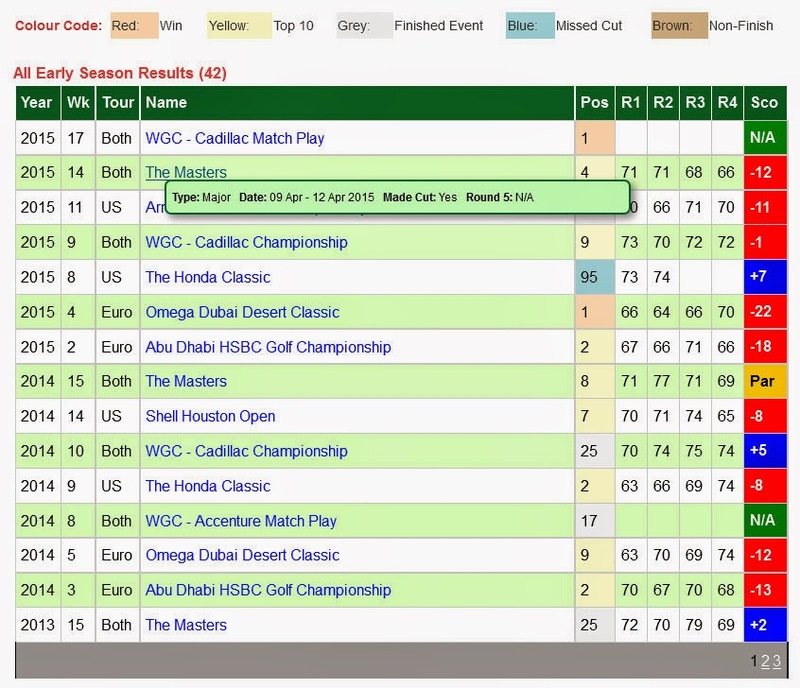 The final two screenshots above show snippets from the new Season Segment Data page for each golfer. Clicking on a golfer name in any of the two new menu options will display this new page. 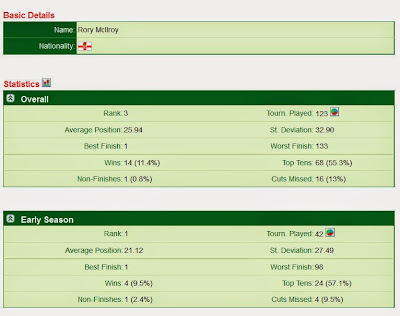 The third screenshot above shows two of the stats panels and the fourth screenshot shows the list of early season tournaments analysed for Rory McIlroy. Again, you can get more information by hovering over a tournament name, as shown in the final screenshot above. The actual page shows the stats and tournament list for each segment (early/mid/late/overall season). As the current season progresses, the relevant season segment and overall stats will be automatically updated after the results for each tournament is entered into the system. The start date is used to determine whether a tournament is early, mid or late season. Some tournaments start and finish in different months. When this straddles April-May or August-September, the start date will determine which season segment the tournament falls into. Only golfers who have played at least 45 tournaments in the above period will be analysed. This equates to an average of 9 events a year (start of current season) or 7.5 events a year at the end of the current season. This will ensure there are enough results to work with for each golfer and reduce the processing overhead. Currently there are almost 500 golfers in the system that meet this criterion. 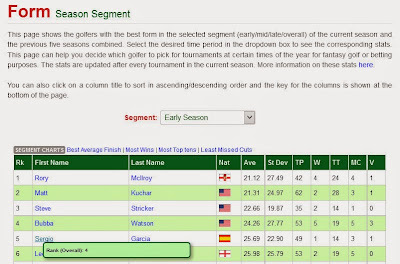 If a golfer has not played any events in a particular season segment, he will be assigned a default average of 250 for that segment and "n/a" will be displayed on the two new season segment menu pages. This is to facilitate sorting on the average column. In most cases, the number of tournaments played by a golfer in the late season segment will be (considerably) less than the other two segments. This is because this time of year includes "silly season" and there are not many big tournaments on either major tour. 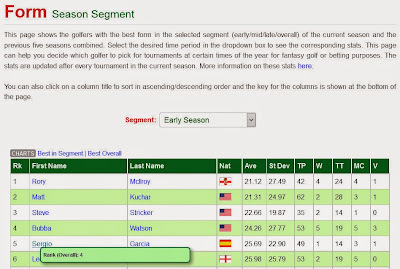 The Season Segment Data page is very similar to the existing Golfer page, except for the (obvious!) fact that a different set of tournaments are analysed to produce the stats. A colour code table is available above the analysed tournaments lists on the Season Segment Data page, as shown in the final screenshot above. There are a wealth of interesting stats now easily identifiable with this functionality. For example, Sergio Garcia is consistently good compared to his peers all year round while Dustin Johnson is relatively poor late in the year. Also, Hunter Mahan and Bubba Watson appear to rank better early in the year while Hideki Matsuyama and Bo van Pelt should definitely be avoided until mid season! You may have to refresh a page to see the new Form menu options. Bar chart showing the best golfers in the early GP season. Bar chart showing the best golfers in the mid GP season. Bar chart showing the best golfers in the late GP season. Bar chart showing the best golfers in all of the GP season. Pie chart of all the results for a golfer in the early GP season. Pie chart of all the results for a golfer in the mid GP season. Pie chart of all the results for a golfer in the late GP season. Pie chart of all the results for a golfer in all of the GP season. Stacked chart showing all the results for a golfer in early/mid/late/overall GP season. These nine new charts brings the total number of charts on the site to 356. This new functionality is a terrific addition to the site and should greatly assist in picking golfers at certain times of the year. I trust you will find it useful and any feedback (via comments on this article or email) would be most welcome. 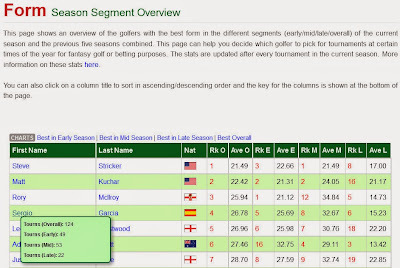 The new season segment analysis functionality is available to all users, although only for the golfers you are permitted to view (all golfers for subscribers, those ranked 26-40 for the overall season for non-subscribers). In addition, non-subscribers will not be able to view all of the new charts listed above. Therefore, sign up today to get the most out of Golf Predictor, the premier European and US PGA Tour statistics site. The predictions for this week, the Wells Fargo Championship (US PGA Tour) and the Open de Espana (European PGA Tour), are now available on Golf Predictor. There is a strong field at Quail Hollow where nine of the top twenty in the world are teeing it up, led by world number one, Rory McIlroy. Meanwhile in Europe, fresh off his close call at The Players Championship, Sergio Garcia once again headlines his home open. George Coetzee (ranked 1st by Golf Predictor) won the inaugural AfrAsia Bank Mauritius Open on the European PGA Tour. The 28 year old South African won his third tour title at the second extra hole of a play-off with Thorbjorn Olesen. After coming out of the blocks quickly on the final day, the birdies dried up after the fifth hole for Coetzee until he holed the tying putt on the last to catch the Dane. It was an impressive return to action for Olesen, who was making his first outing in three months following an operation on a hand injury. Including the winner, we had six of the top thirteen plus ties (6/19) in the weak fielded event. Rickie Fowler (ranked 26th by Golf Predictor) won The Players Championship on the US PGA Tour. The 26 year old American responded to the recent poll which named him as the most overrated golfer (with Ian Poulter) in the best possible fashion, winning the prestigious title in some style. On an exciting final day at Sawgrass, Fowler produced one of the great finishes in the tournament history, covering the final six holes in six under par to post what looked like a winning score. However, a barrage of late birdies saw Sergio Garcia and Kevin Kisner draw level and a couple of others just fall short. However, Fowler was not to be denied and he continued hitting great shots at the par three seventeenth in particular. Indeed, Fowler won the aggregate play-off in overtime at the seventeenth against Kisner after Garcia was eliminated after the initial three extra holes. Our top ranked player, Rory McIlroy, finished in tied 8th without ever threatening the lead and we had seven of the top seventeen plus ties (7/23) in an event where a lot of the bigger names floundered. I am pleased to announce the addition of an experimental Bookie Comparison feature to Golf Predictor. This new feature is available on the Rankings (Odds) page on the Predictions menu and it is a visual comparison of the GP rankings with the bookie rankings for a tournament. As can be seen in the first screenshot above for the 2015 Omega Dubai Desert Classic, there is a new Bookie Rank ("B Rk") column and the Odds column is now colour coded. Undervalued golfers are shown in green, with deeper shades representing better value. Similarly, overvalued golfers are shown in red,with deeper shades representing worse value. Golfers ranked about right by the bookies (according to Golf Predictor!) are shown in yellow/gold. Hovering over the odds column will show the best price of the bookies surveyed and the bookie(s) offering that price. For tournaments with this new bookie information, a new row has been added with the same bookie information to the General panel on the 'Prediction Data' page for each golfer. 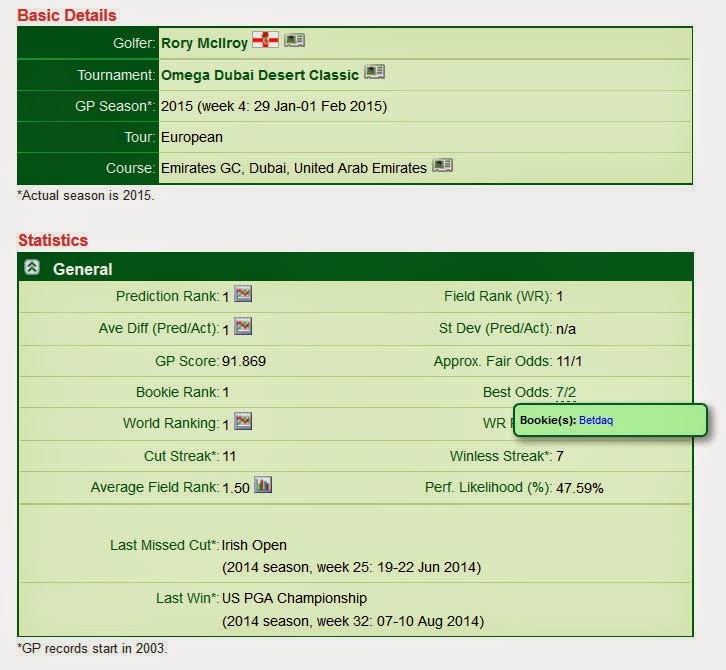 This is shown in the second screenshot above for Rory McIlroy, also for the 2015 Omega Dubai Desert Classic. However, on this page, the bookie rank and best price are shown directly and the bookie(s) offering this price is shown in a pop-up box. The bookie rank is the average ranking of the golfer from all the bookies offering odds at query time. The number and names of these bookies will vary from day to day. This functionality works by comparing this average bookie rank with the GP rank. Golfers with a higher GP rank than bookie rank are considered undervalued and vice versa. The bookies used are all European, due mainly to the legal issues with on-line gambling in the US and the resulting difficulty in sourcing odds from there. I assume the odds/rankings of Las Vegas bookies would be pretty similar in any case. This functionality may or not be available for some or all future tournaments. If enough people find it useful, I'll do it for as many tournaments as possible. Otherwise, I may just do it for the bigger events. Further to the above point, this new functionality is initially available for The Players Championship this week, but not for the smaller event in Mauritius. If the functionality isn't available the Predictions (Odds) page will look the same as before, except for the Bookie Rank column, which will read "n/a". When available, the bookie comparison will appear on the Monday or Tuesday of the tournament week, depending on the availability of the bookie information. 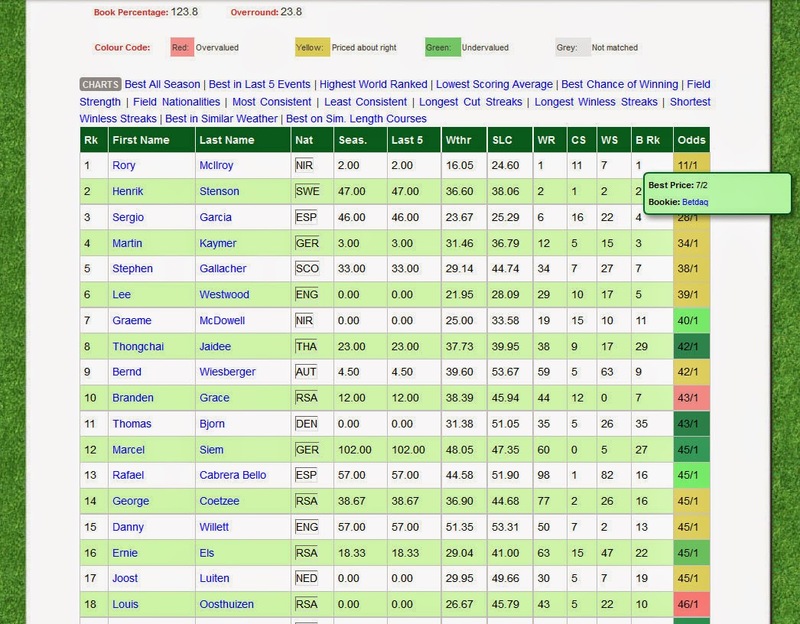 When this bookie comparison is available, a colour code table is displayed on the page, as shown in the first screenshot above. The odds are most valid on the day they appear. Bookie odds change over time for various reasons, but there is no automatic odds updating at the moment. Further to the previous point, the odds are only valid before a tournament starts. Therefore, the odds and c comparison will disappear on the day the tournament starts. Depending on where the tournament is held in the world relative to the time-zone of the server Golf Predictor is hosted on, this may mean they are still available for Asian tournaments for a while after they start. As shown above, some of the bookie names are links. These represent bookies which Golf Predictor is an affiliate of, so if you plan on signing up to the bookie in question, please sign up via the link! I trust you will find this new premium feature useful. Any feedback (via comments on this article or email) would be most welcome. Like other premium features, non-subscribers can only see this bookie comparison information for golfers ranked 11-25 in the prediction rankings. Therefore, sign up today and reap the full benefits of Golf Predictor, the premium professional golf statistics site. The predictions and statistics for this week, The Players Championship (US PGA Tour) and the AfrAsia Bank Mauritius Open (European PGA Tour) are now available on Golf Predictor. As usual, there's a very strong field for the so called "fifth major" in Florida. The only absentees from the current top fifty in the world rankings are Europeans Victor Dubuisson and Tommy Fleetwood. That doesn't leave much top talent for the European Tour, which heads to Mauritius for a new tournament. Despite the swanky location in the Indian Ocean, only three golfers are inside the top one hundred in the world rankings. Rory McIlroy (ranked 1st by Golf Predictor) won the WGC - Cadillac Match Play Championship on the European/US PGA Tour. On the eve of his birthday, the 25 year old world number one secured his second WGC title with a 4&2 win over Gary Woodland in the final. McIlroy came through some close tussles with old nemesis Billy Horschel, Paul Casey and Jim Furyk to give himself an early birthday present! Danny Willett defeated Jim Furyk 3&2 in the third place play-off. Despite the format change this year, a surprising number of the bigger names still exited after the round robin stage. There were no other events on the two major tours this week.